A peony with a dreamy name that looks like it came straight out of a fairy tale? That must be Paeonia Moon over Barrington! The huge, blushing flowers have a wonderful rose fragrance. While in bud this peony is pale pink in colour, but she will slowly transform to a creamy white colour during blooming. The best characteristics? 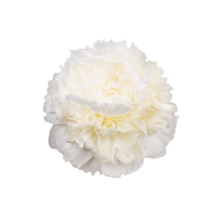 Firstly Moon over Barrington is a very exclusive double-flowered peony that opens up in the shape of a rose. Also the huge flowers can grow up to 18 cm in diameter and are supported by large branches with green leaves that are strong and sturdy. But most importantly, they smell awesome! The Klehms have bred popular peony varieties such as Bowl of Cream, Coral Sunset and Dinner Plate. An impressive list that Moon over Barrington, registered in 1986, absolutely belongs to. In the first place it is important to notice that Paeonia Moon over Barrington will not open if it’s cut before it has had the chance to grow some colour. Therefore it’s better to wait a bit longer if the bud isn’t pink on the inside and is still firm.